Gene has over 10 years of experience as a Massage Therapist with certification in a multitude of massage techniques. He earned his Masters in Acupuncture and Herbology with specialization in Medical Qi gong and is a black belt in Kung Fu, Karate, and Jin Mu. 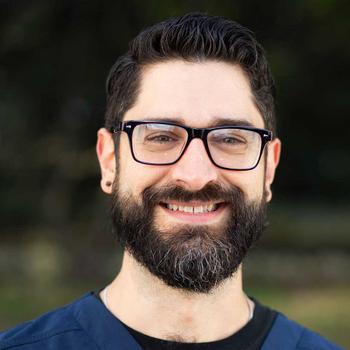 He provides massage therapy as well as instructs mind-body sessions with our residents where he implements techniques to aid in stress and pain management, allowing clients to deepen their mind-body connection. Gene enjoys finding adventure in everyday life and the study and practice of meditation. In his free time, you can find him hiking, rock climbing, or practicing Martial Arts.